Serve breakfast, lunch, dinner, snacks and desserts in these versatile and attractive Asian bowls. Nesting bowls are an incredibly versatile and important part of any Chinese and Japanese tableware set. All of our nesting bowl sets are aesthetically pleasing whether the bowls all share the same design or all have different patterns. Japanese bowls at Mrs. Lin�s Kitchen come in a wide variety of styles, colors, sizes, and price ranges. You'll find what you need here. Our variety of Japanese bowl sets is so large that you can find bowls of any type here. Choose from multi-colored Japanese rice bowls or solid-colored ones; pick between smooth rimmed ceramic noodle bowls or ones with undulating rims; browse through our deep-set Japanese ramen bowls or find some shallow Japanese serving bowls. The choices are endless! Whether you�re looking for a set of Japanese rice bowls or a set of bowls from a specific tableware collection, Mrs. Lin's Kitchen will make sure to help you find that perfect bowl set to welcome onto your dining table. 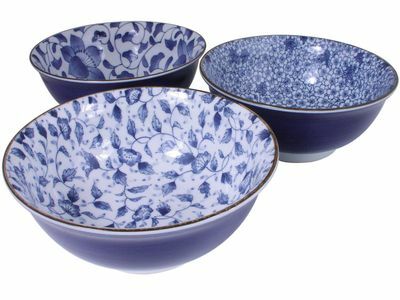 Find the perfect Asian nesting bowl set to put into your kitchen shelves today!